GM-elect Carlsson on the move! Pontus Carlsson is finally getting the recognition that he deserves. The 24-year old phenom from Sweden has recently earned his 3rd norm and at press time, has apparently earned the requisite 2500 rating to have his title confirmed later in the year. The past few years have been especially exciting for Carlsson as he has kept a rigorous schedule. Spain has been especially hospitable to Carlsson since it was where he earned several IM and GM norms. In addition, it has also been a place to practice the language of his birth country, Columbia. 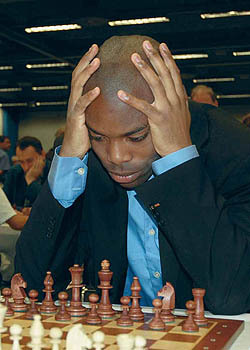 Currently, he is playing in the Sigeman & Company Chess Tournament in Malmo, Sweden. Carlsson has considered playing in the U.S. World Open, but told The Chess Drum that he will opt for the Swedish Championships. Carlsson has dramatically improved his ELO and a few short years ago, he did not hold a FIDE title. As a Grandmaster, he will be able to negotiate conditions and the world will finally get a chance to see this fascinating personality close up!